Driven by a strong economy worldwide and rising corporate confidence, global dividends in 2017 reached record levels. Payouts rose 7.7% last year – the fastest pace since 2014 – to $1.3 trillion. Domestically, payout growth in the U.S. rebounded from a sluggish 2016 when election uncertainty caused companies to hold off their investment and dividend plans. The U.S. posted dividend growth of 6.3% last year compared with just 1.7% in 2016, he said, with a record $438.1 billion in payouts made to shareholders. However, the star of the dividend show was Asia, according to a study conducted by asset manager Janus Henderson. Asia-Pacific companies grew their dividends the fastest, climbing by 12.7% in the 12 months to the end of May to a record $283.5 billion, out of a total of $936.8 billion for dividends generated in the rest of the world — dwarfing the growth rate of dividends elsewhere. Between 2009 and 2018, the value of annual dividends paid out by Asian companies tripled, while payouts from the rest of the world doubled in value, according to the study. This just shows you how the world has changed in 10 years. Back then, many of Asia’s top businesses were growing quickly, but were not worried about paying income to their shareholders. That perception holds today among investors even though many Asian corporate managements have changed their attitudes towards dividends and now pay out generously. The numbers back up that change in attitude. In 2017, Asia Pacific companies accounted for $1 for every $6 of the dividends paid worldwide, up from just over $1 in every $9 paid out in 2009. A big contributor has been China where dividends payments have grown from just $8 billion in 1998 to $111 billion in 2016. 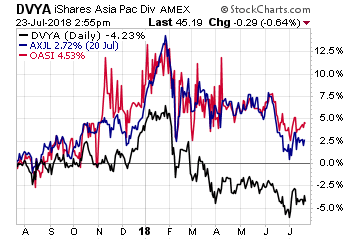 I believe Asian stocks have more potential for long-term dividend growth than their U.S. counterparts for a number of reasons. Despite the trade war rhetoric, earnings growth among Asian companies has maintained the momentum that started in late 2016, which reversed a three-year trend of deflation and earnings declines for many companies. Asian companies have also weaned themselves from an over-reliance on debt, and today are less leveraged than those in the United States. And of course, the broader Asia growth story and rise of the consumer class is still alive and well. Valuations among these companies are also far more attractive than they are in the U.S., thanks to U.S. fund selling driving down the prices of most Asian stocks. In other words, U.S. markets have already built huge earnings expectations into many stock prices and valuations are at historically high levels. By contrast, many Asian stocks have already had the worst case trade war scenario built into them. If you are interested in capturing some of that dividend growth potential from Asian stocks, there are several ways to do it. The first is an old-fashioned, but effective, way. You can buy a mutual fund from a company whose sole focus is Asia – the Mathew Asia Dividend Fund (MUTF: MATIX). Its top holdings include well-known blue chips such as Taiwan Semiconductor and HSBC. But it also includes less well-known names to American investors including Shenzhou International Group Holdings, which is the largest knitwear manufacturer in China and makes clothing for Nike and others. Its stock soared an incredible 4200% over the past decade! The next way for you to access Asian dividends is through exchange traded funds (ETFs). There are several that focus on Asian dividend payers, including the iShares Asia/Pacific Dividend ETF (NYSE: DVYA), the WisdomTree Asia Pacific ex-Japan Fund (NYSE: AXJL) and the O’Shares FTSE Asia Pacific Quality Dividend ETF (NYSE: OASI). Some of these ETFs (WisdomTree) have familiar names such as Samsung Electronics, Taiwan Semiconductor and China Mobile in them. While others have more of an emphasis on bank and utility stocks. My personal preference would be to go with the ones that have the growth names in them in hopes of capturing a rising dividend stream. Of course, the final option is to simply buy some of the high-dividend paying stocks such as China Mobile (NYSE: CHL), which listed on the New York Stock Exchange back on October 22, 1997. This stock used to be a high-flyer because of the rapid growth it enjoyed. But now the Chinese phone market is saturated and its stock performs like any other utility. The company had a payout ratio of 48% in 2017. China Mobile had a final dividend payment of $0.20 per share for the year ended 31 December 2017. Together with the interim dividend payment of $0.21 per share, and a special dividend payment of $0.41 per share to celebrate the 20th anniversary of its IPO, the total dividend payment for the 2017 financial year amounted to $0.82 per share. 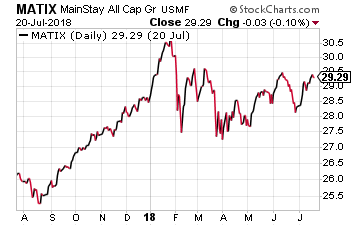 Its current yield is 4.66%, although that has been offset by that U.S. fund selling (trade war fears) that has sent the stock down almost 13% year-to-date. So if you’re going to buy the stock, do it piecemeal because the trade war winds are still blowing. But once again, my preference would be to buy a broad-based fund or ETF that has a number of dividend-paying companies in the portfolio.